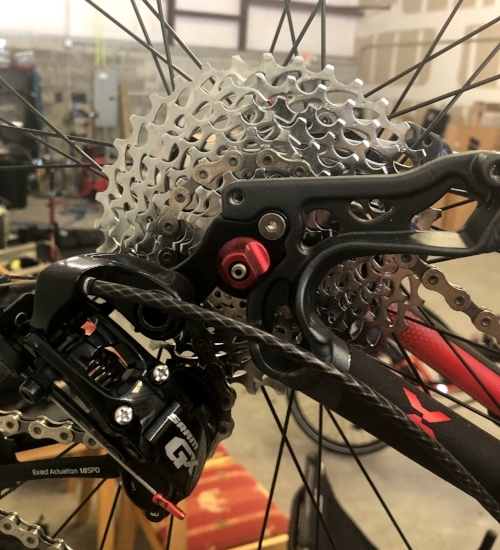 Improve your shifting, Improve your ride! Your bike probably has a lot more gears than you use on a typical ride. Knowing how to use them correctly can be the difference between fun and frustration. Here are some tips for getting the most out of your shifting. It may seem counter-intuitive, but a steady cadence is the key to getting the most from your bike. Some people think they have to pedal as hard or as fast as they can until they can’t keep up the pace and then have to slow down and recover. Like a hamster in a wheel they look busy but don’t go that far. The truth is your cadence shouldn’t be different on a flat road or climbing a hill. The goal is to keep a steady “I could do this all day” pace. While professional riders may spin at 85-95 RPMs, you will probably be happier at a slower pace. I find that a casual rider can maintain 60 RPMs without too much trouble, although some will have to work up to that pace. This pace allows good speed without over taxing the heart and lungs, resulting in longer more enjoyable rides. Mastering easy spinning of the pedals will make it possible (with enough practice) to go as far as you want. You can go 10 miles or 50 miles depending on your cadence and effort. The more you stay in a comfortable range the longer you can ride. My cadence is fairly steady no matter if I am going 10 mph, 20 mph, uphill or downhill. If I am trying to sprint I might get my cadence up to around 90, but as soon as the sprint is over, my cadence goes back to normal. I try to keep my cadence and effort steady so I don’t burn all my energy before my ride is done. On days where I don’t have much time to ride I pick up my pace and on longer rides I tone it down. Most bikes or trikes have two or three gears in front and a cassette of gears in the back. Think of the front set of gears as the big jumps and the cassette as smaller steps. For the cassette, the largest gear is the easiest and the smallest gear is the hardest. So if you are going up a hill, you might want to shift to the smaller ring in front and a larger gear in back. Once you get to the top, you would shift to a larger gear in front and a smaller gear in back to go fast downhill. I see lots of shifting in your future! Knowing when to shift is easy when you know what to look for. The signal to shift is whenever something changes in your effort or cadence. If you are finding it more difficult to keep your steady pace that means you need to shift down to an easier gear. If you find it too easy to pedal, shift to a harder gear. Simple! The problem is sometimes you ignore the signal and decide to power through. Smashing a gear that is too tough is a good way to reduce your range and potentially hurt your knees. Just like a pulley makes it easier to lift a heavy weight, spinning gears at a faster pace with lighter effort is better because you do the same work with less effort. If you about to climb an overpass, shift right before the incline starts. You might need to shift down two or three gears to get to one that allows you to keep an even effort and cadence. Of course some hills are long enough or steep enough that you run out of easier gears and have to suffer to the top. When I was riding in Colorado there were plenty of times I was wishing for more gears (and more Oxygen). Don’t forget to plan ahead for stopping. You don’t want to be stuck starting in a gear that is too hard! On your next ride, try to maintain a 60 RPMs. Get to that pace and see how you feel. If it feels too hard, shift down to a gear you can keep that pace going. If you can’t sustain that pace no matter what gear you choose, try working up to that pace by maintaining it for a minute or two and then resting. Then work on getting to five or ten minutes. Before you know it you will be going for an hour and be surprised how easy it seems.